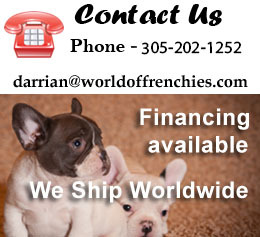 We are a small family owned and operated business located in the heart of Miami, Florida and specialize in breeding standard and exotic French Bulldogs. 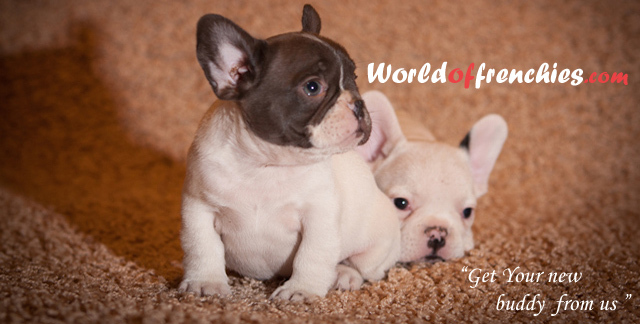 Because we are small we offer high quality care for your new French bulldog puppy. If you are looking for a healthy, happy well-adjusted French bulldog you have come to the right place. Our French Bulldogs have wonderful dispositions, funny personalities, beautiful blocky heads, and those great bat ears the breed is known for. Our main priority is to produce high quality, healthy AKC French bulldog puppies with sound temperament and amazing conformation. Over the years we have chosen and raised quality dogs and continue to keep selling commendable puppies at a high level. Our pets are provided with fresh clean water, high quality food, daily exercise, affection and outstanding general health care. Some of our French Bulldogs have been placed with people with disabilities, as therapy dogs, and they have proven to be great companions.